We loved Northampton so much last time we decided to come back again. This time visiting Nick & Joe in their new house near the old lift testing tower which was looking spooky in the nighttime fog. 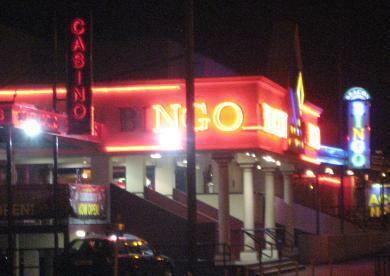 For a wild Northampton night out, we went and played bingo! It was quite good… as an experience. …I mean …I suppose it’s something everyone should try at least once. ….maybe just once in fact. tempted?Bingo announcers (or whatever they’re called) have a funny way of reading out numbers. e.g. “Four and six, forty-six…. All the threes, thirty three…. nine and one, ninety-one….” and so it goes on. It goes quite fast, and one interesting aspect of the rules we didn’t really realise at the time: If you are lucky enough to get a “line” or two lines or a “full house” you have to shout out as soon as the number has been called out. If they’ve moved on to the next number, you’ve missed it! No prize money for you! Would have been quite annoying to find this out the hard way. As it was, we didn’t get any lines or full houses, but then it seemed like quite a big bingo hall. Probably 200-odd people. So the chances were pretty slim. Everyone groans each time somebody wins, which was quite amusing to join in with.